Natural Gas Storage occurs underground in depleted oil and gas fields, aquifer reservoirs, and salt caverns. 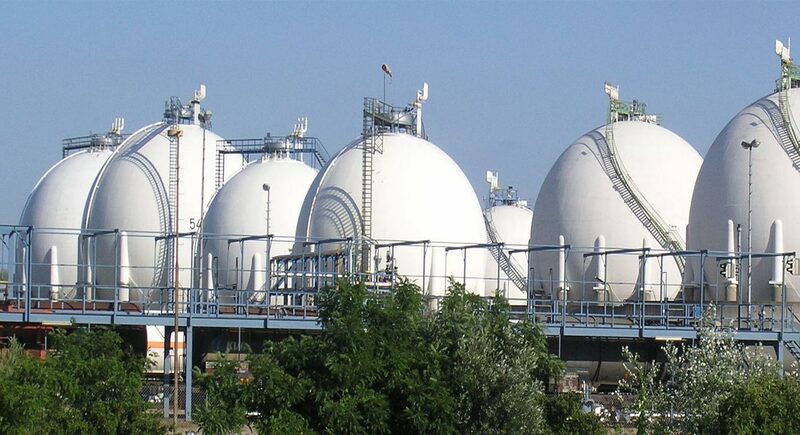 Liquefied Natural Gas is stored above ground in tanks. Natural gas is stored during periods of lower demand and withdrawn during periods of higher demand. Natural gas storage is most often used to meet seasonal demand. Depleted Natural Gas or Oil Fields - The most common storage method is in depleted natural gas or oil fields, typically close to consumption centers. By converting a field into a storage facility, companies can take advantage of existing wells, gathering systems, and pipeline connections. They are the most common sites because of their wide availability. Aquifer reservoir - An aquifer is suitable for gas storage if the water-bearing sedimentary rock formation is overlaid with an impermeable cap rock. While the geology of aquifers is similar to depleted production fields, their use in gas storage usually requires more base (cushion) gas and greater monitoring of withdrawal and injection performance. Deliverability rates may be enhanced by the presence of an active water drive. Salt caverns - These storage facilities provide very high withdrawal and injection rates relative to their working gas capacity. Base gas requirements are relatively low. The large majority of salt cavern storage facilities have been developed in salt dome formations located in the Gulf Coast states. Cavern construction is more costly than depleted field conversions when measured on the basis of dollars per thousand cubic feet of working gas capacity, but the ability to perform several withdrawal and injection cycles each year reduces the per-unit cost of each thousand cubic feet of gas injected and withdrawn. Liquefied Natural Gas (LNG) is stored above grounds in storage tanks that are specially designed to maintain the low temperatures required to keep the gas in liquid form. The rate at which natural gas is consumed fluctuates from day to day and season to season. For this reason, natural gas storage is an important part of the overall energy system. Storage can also be used to respond to changes in natural gas prices The National Regulatory Research Institute.“Gas Storage:Strategy,Regulation,and Some Competitive Implications”.September 1990http://www.ipu.msu.edu/library/pdfs/nrri/Duann-Nagler-Gas-Storage-90-14-Sept-90.pdf The National Regulatory Research Institute.“Gas Storage:Strategy,Regulation,and Some Competitive Implications”.September 1990http://www.ipu.msu.edu/library/pdfs/nrri/Duann-Nagler-Gas-Storage-90-14-Sept-90.pdf The National Regulatory Research Institute.“Gas Storage:Strategy,Regulation,and Some Competitive Implications”.September 1990http://www.ipu.msu.edu/library/pdfs/nrri/Duann-Nagler-Gas-Storage-90-14-Sept-90.pdf . Sorry, we do not yet have a video specifically for Natural Gas Storage. We are adding new videos to StudentEnergy.org weekly, but in the meantime check out this video on Natural Gas. Natural Gas Transport refers to the various methods of transportation used to move natural gas from one location to another. It is primarily transported by pipeline on land and ship on water. Liquefied natural gas (LNG) is natural gas that has been converted liquefied for ease of storage or transport. A power plant is an industrial facility used to generate electric power with the help of one or more generators which converts different energy sources into electric power. Steam methane reforming (SMR) is a process in which methane from natural gas is heated, with steam and a catalyst, to produce synthetic fuel.